This was a tough day for me . . . I've been maintaining my overall health by see my chiropractor/accupuncterist twice a month. It seems I've hit a plateau (wall) and I'm not able to do all the things I want to do without pain. Grrr! Very frustrating! I watched a Documentary on Netflix called "The New Medicine" ~ a thought-provoking program exploring the use of holistic remedies in modern medicine, filmed by Dana Reeve, Christopher Reeve's (Superman's) wife, just before her death from lung cancer. This 2 series video gave me the courage to share my concerns with my chiropractor/accupuncterist. So, this morning I went in to have a talk with my doctor. I'm thankful for the empathy and sincerity of heart my doctor has . . . He truly cares, and that made all the tears I shed in his office a healing release, and not an embarrassment. Unfortunately, most doctors are great at pushing pills to cover up symptoms, but never really take the time to "hear" and treat the whole person. You're probably wondering, "What does all this have to do with Hot Wings?" Will is still away on business and I needed a bit of comfort food . . . Normally I would buy legs or thighs because they're more cost effective, but today, I threw all caution to the wind and bought 1.75 lbs. of the most beautiful chicken wings (all trimmed and ready to season)! Having only made chicken wings once in my life, I headed for Food Network's website for a baked version of hot wings. I was not disappointed! Emeril had the perfect recipe! 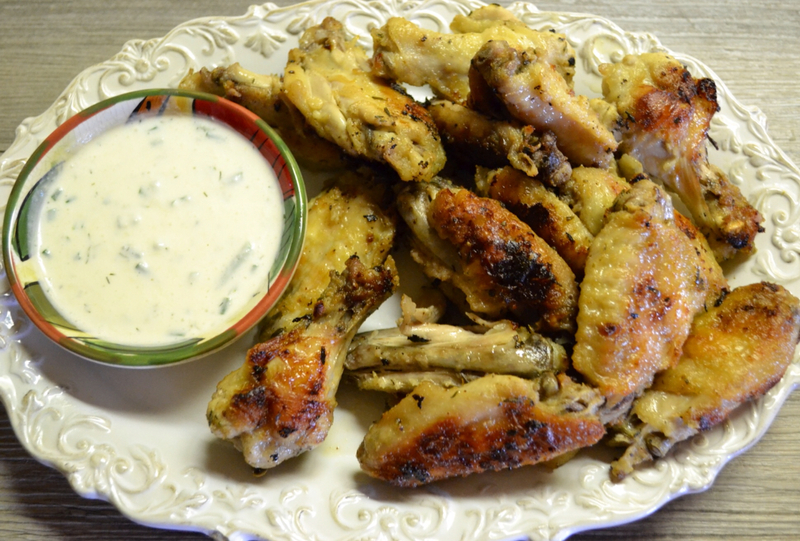 OVEN-ROASTED HOT WINGS with Buttermilk-Parm Dipping Sauce. Line a large rimmed baking sheet with foil. 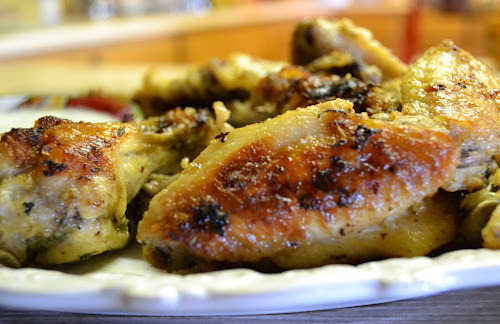 In a large bowl toss chicken wings with lemon juice. Add pepper, garlic and onion powders, and salt. Add thyme, crushing it between your fingers. Add cayenne and melted butter. Stir mixture thoroughly, coating every wing piece evenly. 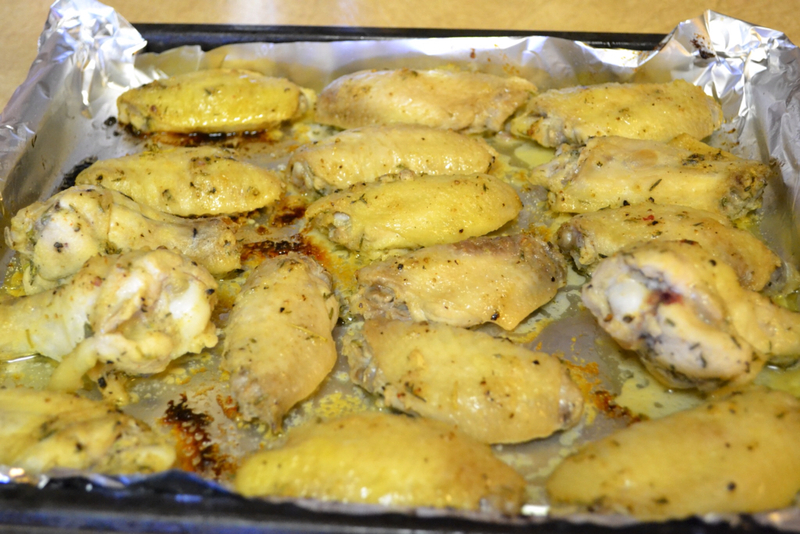 Arrange wings in a single layer on baking sheet. Bake 20 minutes; rotate baking sheet, and flip wings. Bake until wings are browned nicely and cooked through, 10-13 minutes. 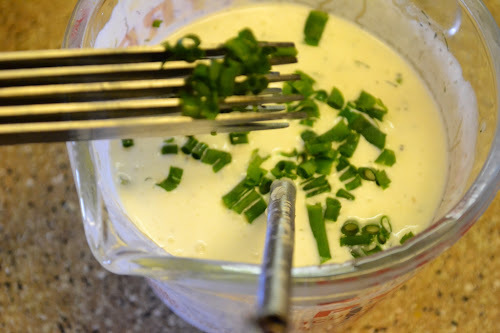 Serve with my homemade Buttermilk-Parm Dipping Sauce. Whisk mayo and sour cream into buttermilk. With a clean pinky, dip and taste . . . You may want to add a bit more lemon juice to perk up the flavor. Serve. Refrigerate any extra. Makes a great salad dressing! Not the greatest photo, but you get to see the crazy herb scissors Will put in my Christmas stocking! I must admit they make quick work of chives and garlic chives on potatoes, in dips, soups and salads! Wings after first 20 minutes. Hot out of the oven and ready for dipping . . . OVEN-ROASTED HOT WINGS . . .Mmmm, Mmmm! Honey, there is nothing that will lift your spirit like a mess of guilt-free, kinda healthy, Oven-Roasted Hot Wings! It was just what the doctor ordered, and the dipping sauce put them over the top! The best part? From start to finish this meal took me 35 minutes. That includes prep and roasting time! I'd like to say I had a salad on the side or at least a couple celery and carrot sticks . . . Oh well, maybe next time . . . Over at Julie's!!! P.S. ~ Will is on his way home via Southwest Airlines even as I'm finishing this post! And no, he didn't freeze to death, lost in a blizzard (but he could have!). The weather was sooo cold, that even though the wind blew fiercely, it couldn't produce enough snow for the forecasted blizzard! The wind chill got down to -4 degrees, certainly not raincoat weather!